Morehouse had Tuskegee on the ropes and let them off the hook. COLUMBUS, Ga. – Jamarcus Ezell came into Saturday’s game intent on honoring the memory of Milo Merriweather, a good friend he lost last year right before the game against Morehouse. After throwing an interception late in the fourth quarter it seemed like there wouldn’t be a win to dedicate once the game was over. A series of events late in the game turned fortunes around and ended with Ezell’s quarterback keeper in overtime as Tuskegee won the 82nd Annual Tuskegee-Morehouse Classic 23-17 on Saturday afternoon. Morehouse started the game on fire, converting a Tuskegee fumble into a touchdown on a halfback pass from Ricci Nuckles to Tamarick Vanover. Hoderick Lowe tied things up for the Golden Tigers with a seven-yard touchdown run early in the second quarter. The Maroon Tigers responded before the half with a 61-yard drive that ended with a field goal, giving us a 17-7 halftime score in favor of Morehouse. Ezell didn’t make any magic in the third quarter, neither team did, but he made up for it in the fourth quarter. The quarterback put the Golden Tigers in scoring position with a 52-yard run up the right sideline. Phillip Brown punched it in three plays later to make it a 17-14 game with 9:43 to go. Morehouse appeared to have the game in hand when Cameron Miller intercepted Ezell with 2:46 remaining in the fourth quarter. If the Maroon Tigers had been able to convert a first down on the change of possession they stood a good chance of running the clock out for the win. Instead, they rushed the ball three times for four yards and only used 1:39. Tuskegee responded with three straight incompletions before Ezell rushed seven yards for a first down. He completed a 45-yard pass to Chardian Johnson on 3rd and 15 three plays later, with just seconds remaining on the clock. Tuskegee spiked the ball at the six-yard line before Dalton Hall drilled a 23-yard field goal, forcing overtime. “They were pretending to double cover our outside receiver but they really weren’t double covering him. We sent a guy up the middle to hold the safety and isolate that guy out there and he was able to hit the pass,” Slater said, explaining the long pass to Johnson. Morehouse got the first crack at scoring in overtime, but Jonah McCutcheon picked off Kivon Taylor’s pass giving Tuskegee the chance to end it with a score. The Golden Tigers sealed the come from behind with the Ezell quarterback sneak to give Tuskegee the win. Ezell was very emotional afterward and swarmed by his teammates after the touchdown. He was eventually given a ride across the field on his teammates’ shoulders once he regained his composure. The quarterback pointed to the sky, sharing a few words with Milo, his friend who is gone but still in his heart. “This game right here was dedicated to him. It really meant a lot to me, I had to win it, I wasn’t going down without a fight,” Ezell said on the field after the game. 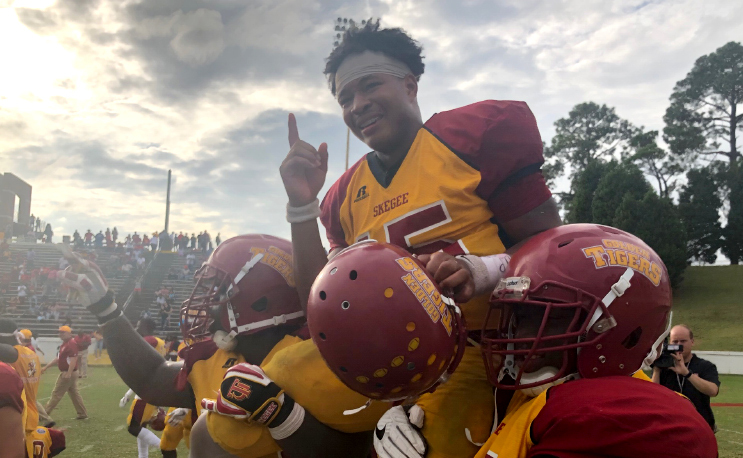 The Tuskegee offense has been maligned all season long, but it is noted that they produced a season-high 336 yards of total offense including 218 passing and 118 on the ground. Morehouse will be left to think about yet another close game that they “coulda shoulda” won. Two weeks ago they lost to Miles by a field goal and on Saturday they were one first down away from finishing off Tuskegee. Morehouse stays on the road next week, with a trip to take on Albany State, so they’ll have to quickly put the sting of this loss behind them. Tuskegee has now won back to back games for the first time this season, they will look to make it three in a row when they face Jackson State next week in the 5th Quarter Classic. Jackson State is coming off a bye week and is currently 0-5 this season.